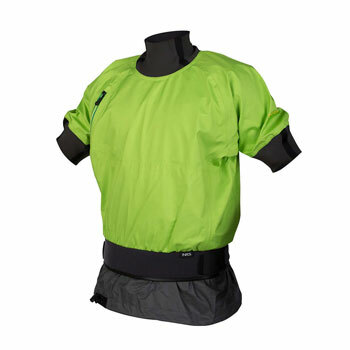 Short sleeve paddling cag suitable for kayaking and canoeing in the summer. Made from NRS' bomb-proof 4-layer eclipse fabric, the Stampede shorty is a fully featured whitewater cag, with short sleeves. The popular Glideskin neck seal is used on the arms as well to provide a watertight yet comfortable seal, so you can paddle all day and remain mostly dry. Ideal for warmer days on the river or in the surf where you need more than a splash top, but a full cag would be overkill. As you would expect with a white-water cag, the Stampede short sleeve jacket has fully taped seams, a double waist seal and high abrasion and puncture resistance. Everything you could ask for in a shorty cag. Short sleeve design frees your arms while still protecting your body's core from cold and wetness. An alternative to more constricting latex gaskets, punch-through neoprene GlideSkin™ neck and arm seals provide all-day comfort while still keeping most water out. HyproTex™ inner skirt and 8 cm double-pull waist mate with your sprayskirt to keep you and your kayak's cockpit dry. A splashproof, zippered shoulder pocket keeps on-the-water essentials close at hand. We offer a delivery service for the NRS Stampede Shorty Cag throughout the UK & Ireland to home and work addresses. We will endeavour to despatch all orders for delivery on the next working day. Orders placed on a Friday will be dispatched the following week. Buy a NRS Stampede Shorty Cag online from our website and collect from our shop at Lee Mill, Plymouth, Devon or you can collect from any branch within the Canoe Shops Group. There is no cost associated with this.